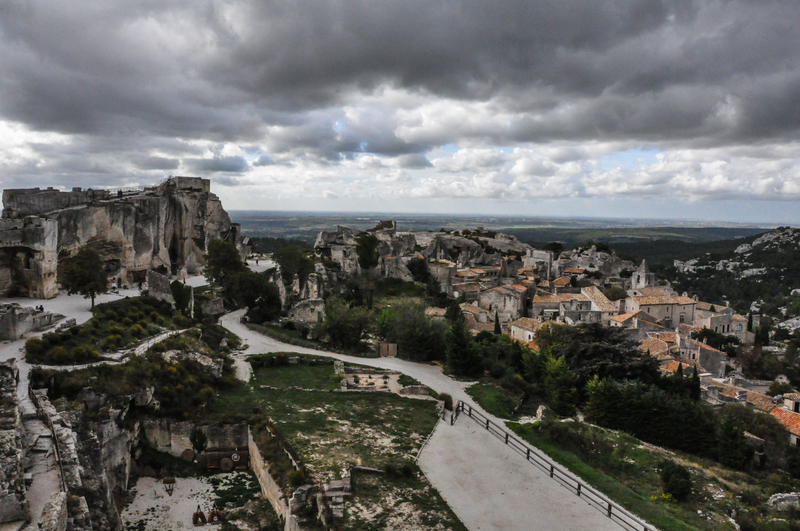 Les-Baux-de-Provence, France, is known for its bloody and ruthless past. Known for pushing individuals off the rocky cliffs, decapitation, and other cruel methods of death, the lords of Les Baux are not characters you’d want to cross. Thus, the area was feared. 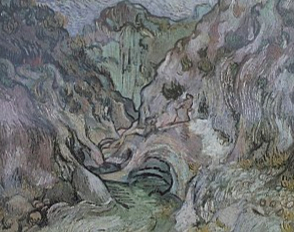 It is said Dante modeled one of his layers of hell in the Inferno off of the rocky landscape of Les Baux. 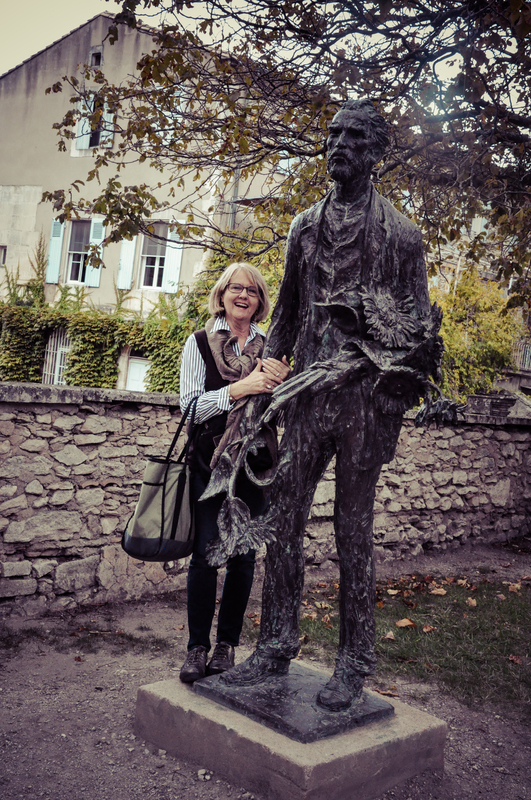 Gabe and I visited Les-Baux-de-Provence on our whirlwind trip to see the lavender this summer. 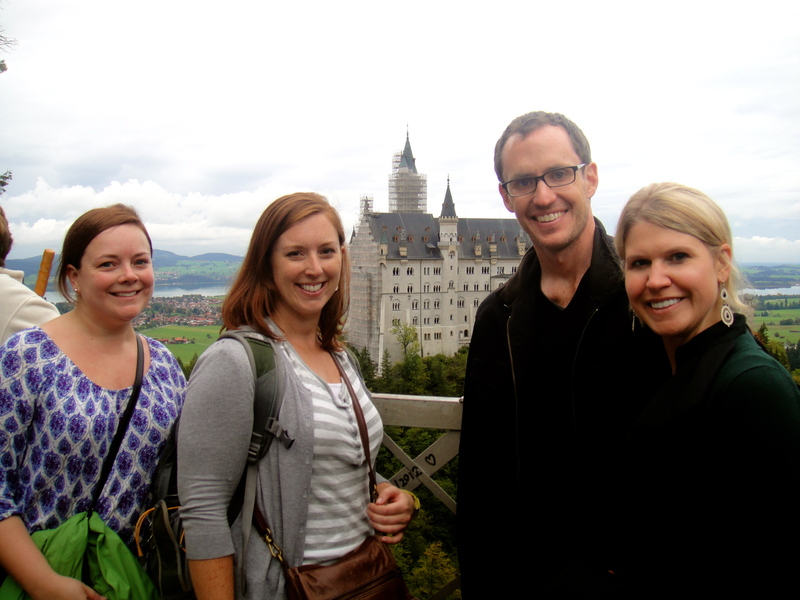 However, short on time, we didn’t climb the entire way to see the castle & fortifications. Instead, we wandered around the village checking out churches and views from the mid-heights. However, this time, Mom & I were up for the adventure. Le Mistral, the fierce Provençal wind, also accompanied us. However, pressing against the bursts had its rewards. 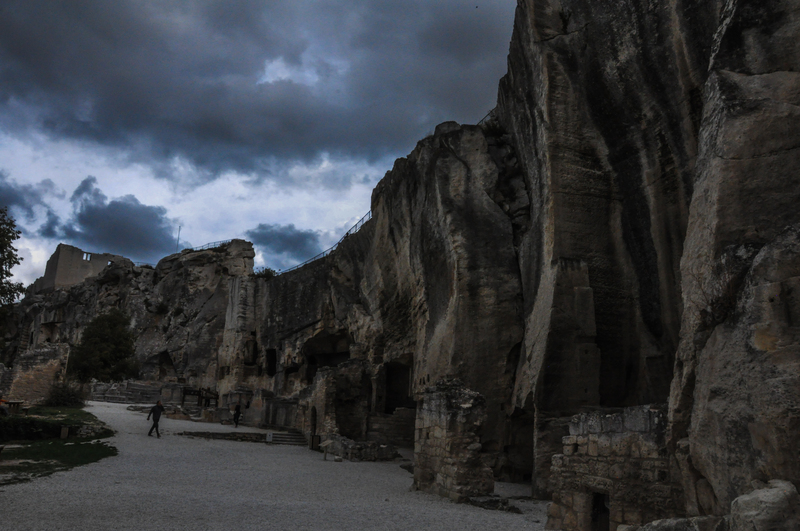 The top was very impressive with bell towers and rooms carved into the face of the stone cliffs. 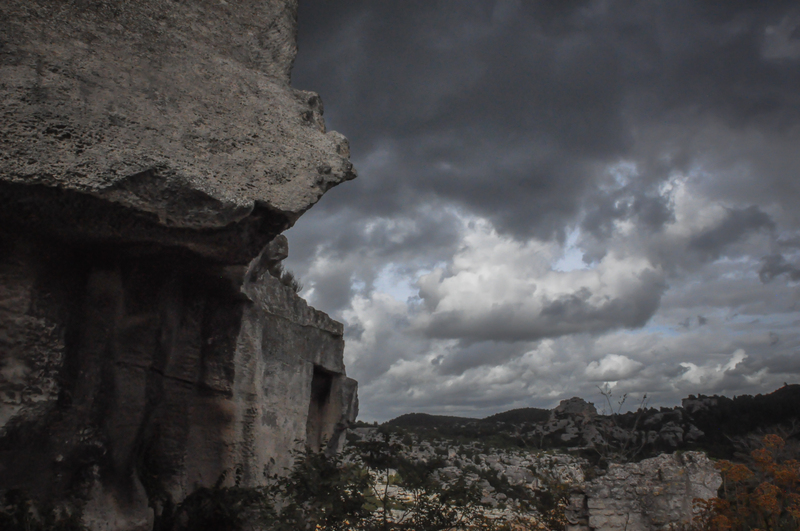 If you go to Les Baux, don’t miss going to the top! 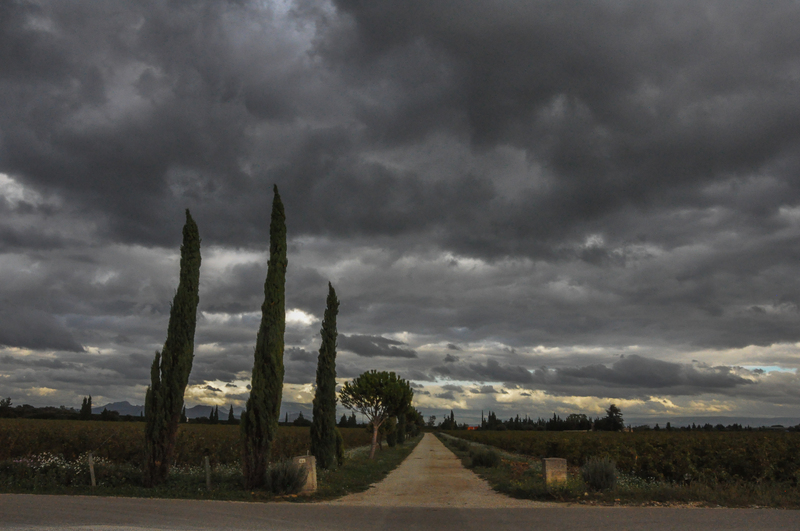 Châteauneuf-du-Pape is a wine region within Southern France. 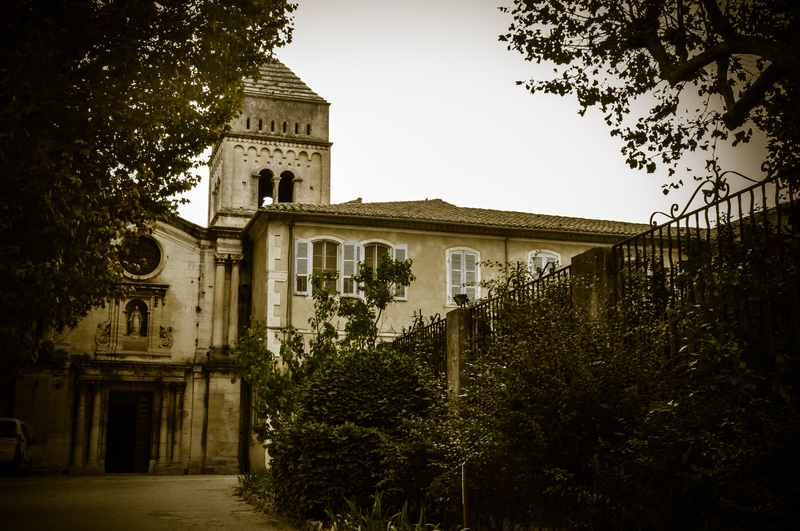 The area became notorious in the 14th Century when Avignon, France, became the seat of the Pope during the Catholic schism. 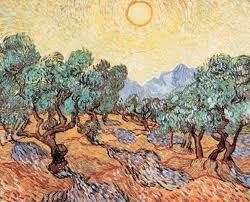 The Popes were lovers of wine and in particular, of Burgundy wines. However, they needed to find a closer source than Burgundy. In 1321, Pope John XXII requisitioned wine from this particular area and the production became named ‘Vin du Pape’ for wine of the Pope. 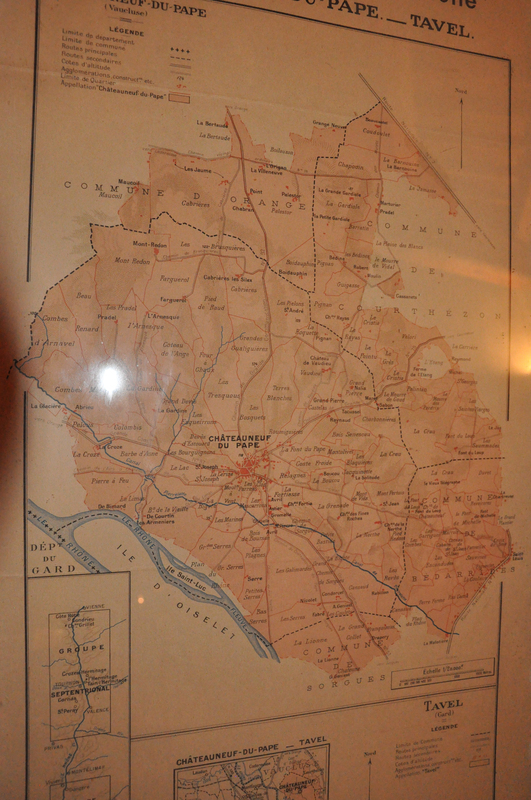 Later the name evolved to Châteauneuf-du-Pape, referencing the wine of the ‘new castle of the Pope’. In addition to its rich history and presence in Beastie Boys songs, Châteauneuf-du-Pape is the wine king of Southern France, claiming price points similar to Burgundy and Bordeaux. 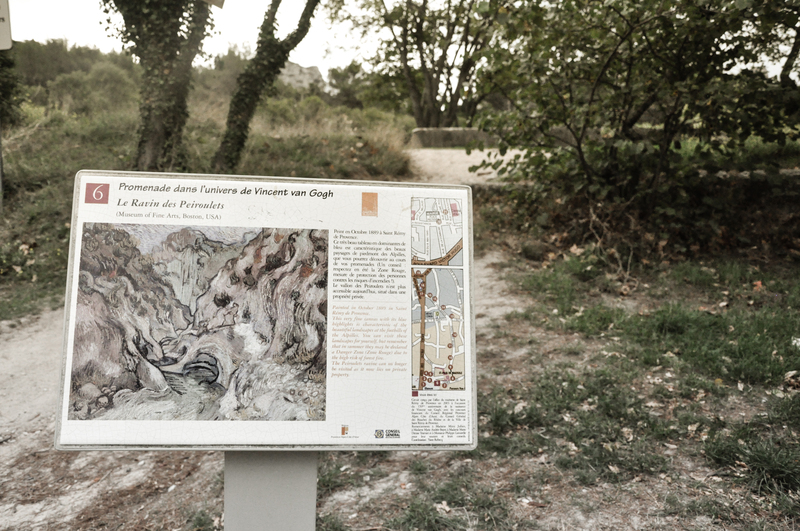 The region is known for the rocky terrain, many meters thick, which was created many years ago when the area was once the bed of the Rhone river. 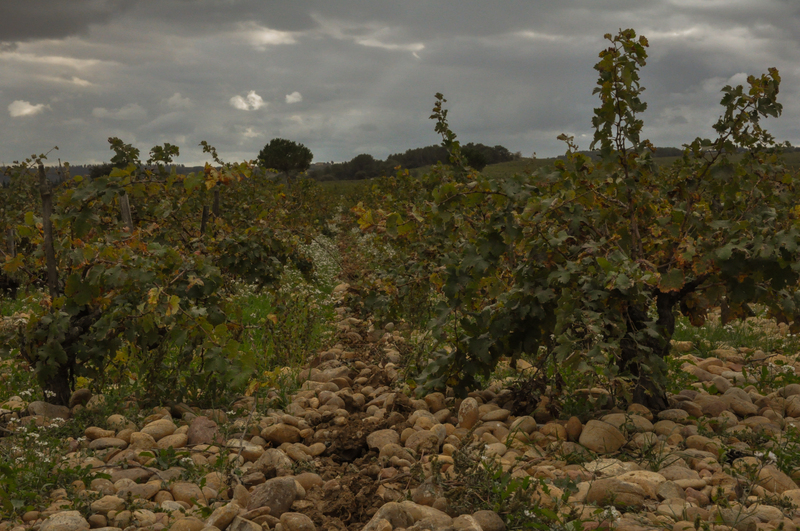 Now the Rhone rests a few kilometers away and the rocks, galets roulés , serve as heaters and water insulators for the terroir. 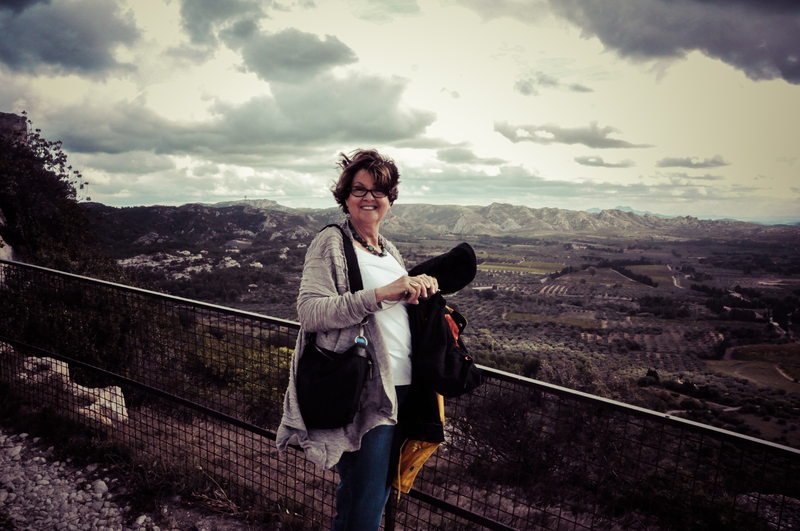 I was lucky to get a special glimpse at this wine area with a group traveling from Virginia. Our first stop on the wine tasting adventure was at Château Beaucastel, a lovely maker of Châteauneuf-du-Pape. 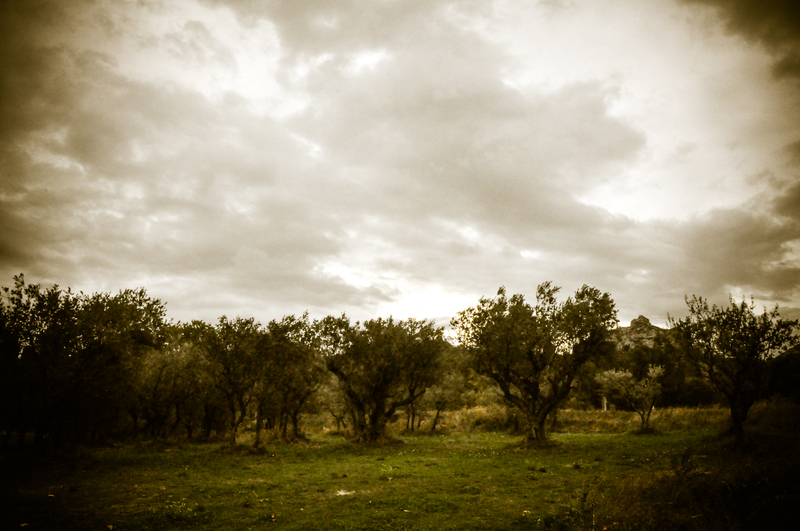 The morning we visited, I had just finished the book, Of Wine And War. Wine was considered France’s national treasure, and the lengths to which the French winemakers went keeping their good wine from the Nazis was really interesting. From sending the bad vintages, to building faux walls, and even burying in in the soil, they tried everything to preserve the historic vintages for France. 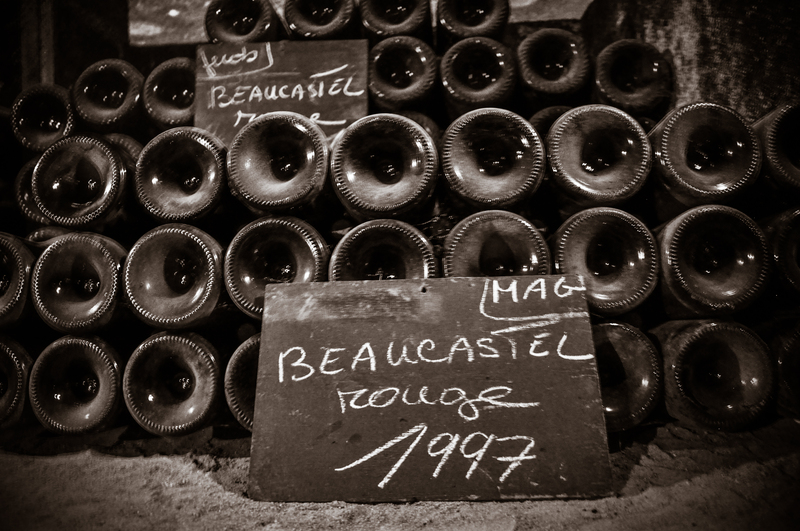 Our guide at Château Beaucastel said not many vintages had likely escaped Nazi hands as there were not many pre-war bottles left today. 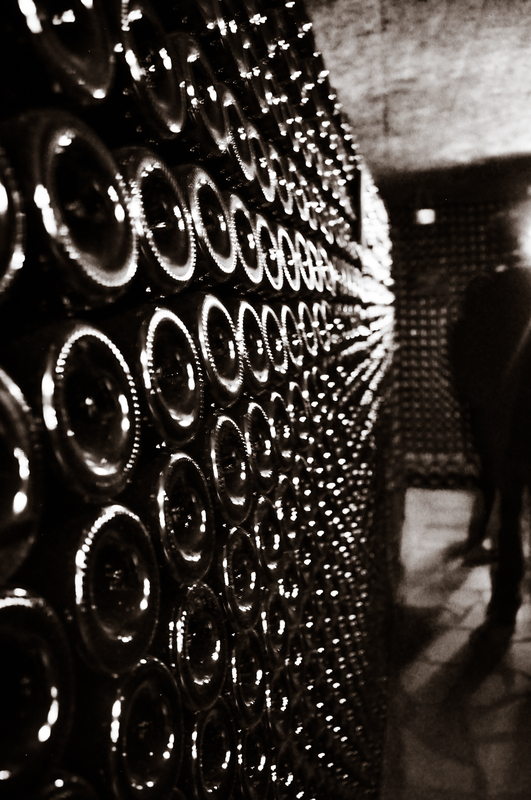 Cellars at Château Beaucastel. I was inspecting for pre-war bottles, but found none. 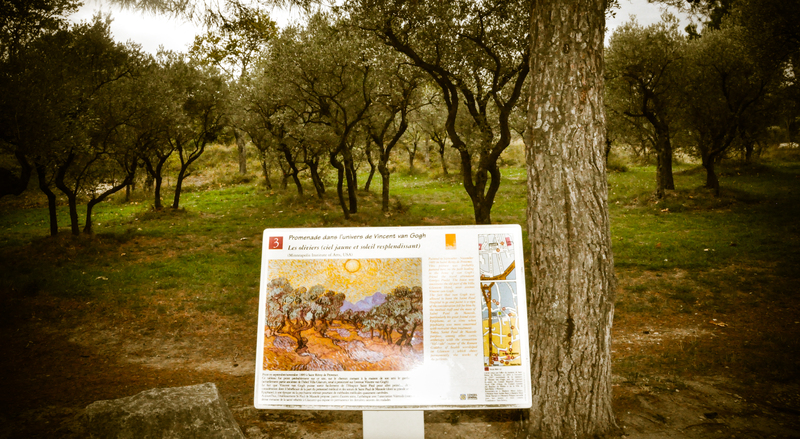 The group also visited domaine de la Mordorée, Domaine Grand Veneur, and La Bastide St. Dominique, all which produce Chateauneuf-du-Pape. After a full day of beer drinking at Oktoberfest on Friday, we had opted to get out of Munich and do a little sightseeing on Saturday. This was both a good and bad idea. The good was that it prevented us from signing up for another day of beer drinking. The bad was that we had to get up early and navigate how to get to the little village we’d selected, all whilst suffering from a bout of cocktail fever. 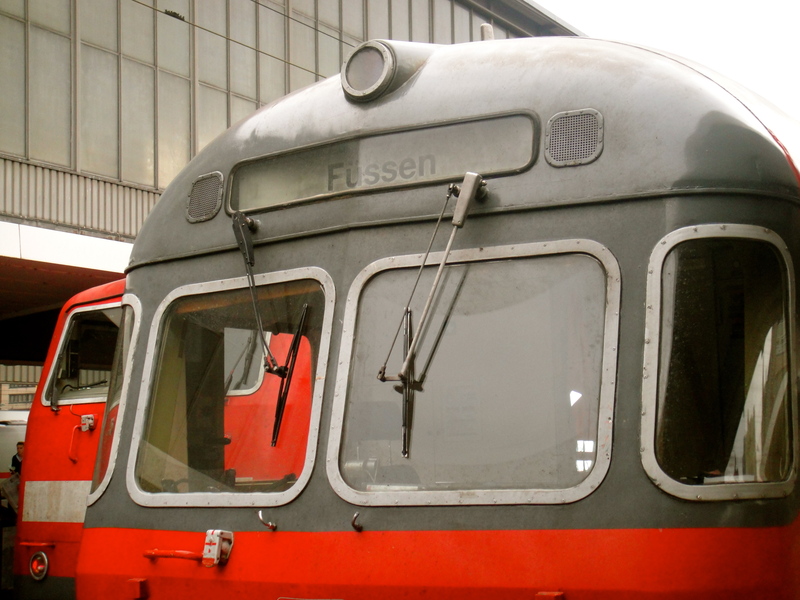 Nevertheless, we boarded the correct train at the München Hauptbahnhof towards Fussen. We marveled at the hoards of people coming in that day for Oktoberfest. Revelers, coming in from their villages, ready for the day. You’ll see some good examples of traditional German dress here. 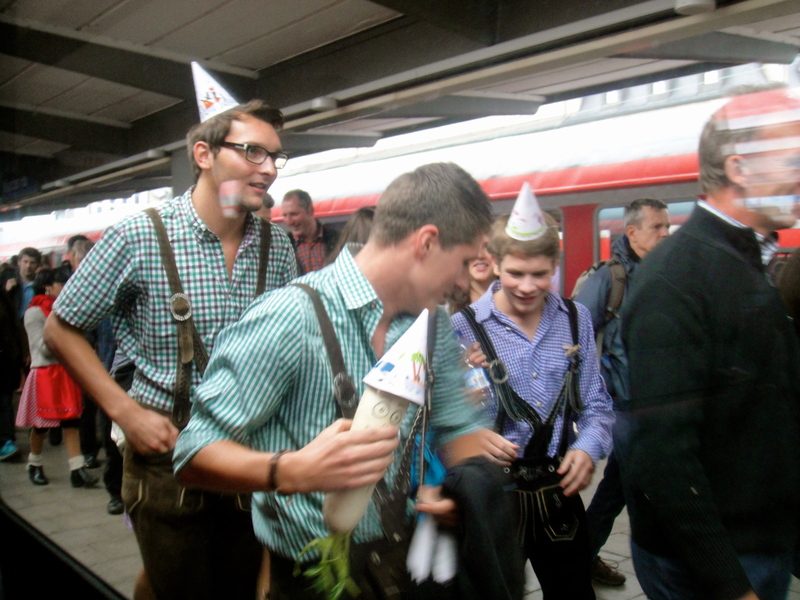 Lederhosen and party hats. Don’t these guys look like they are 16? 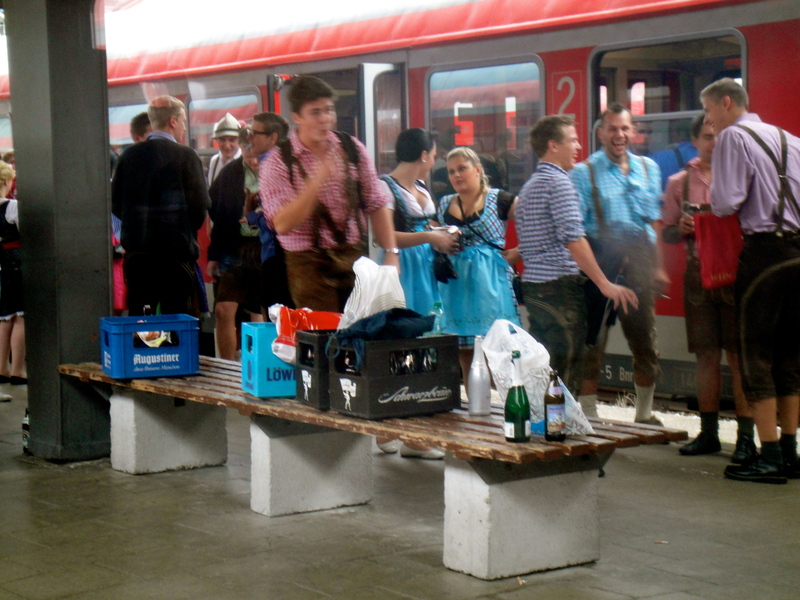 Notice the crates of beer they’d brought with them to consume on the train. 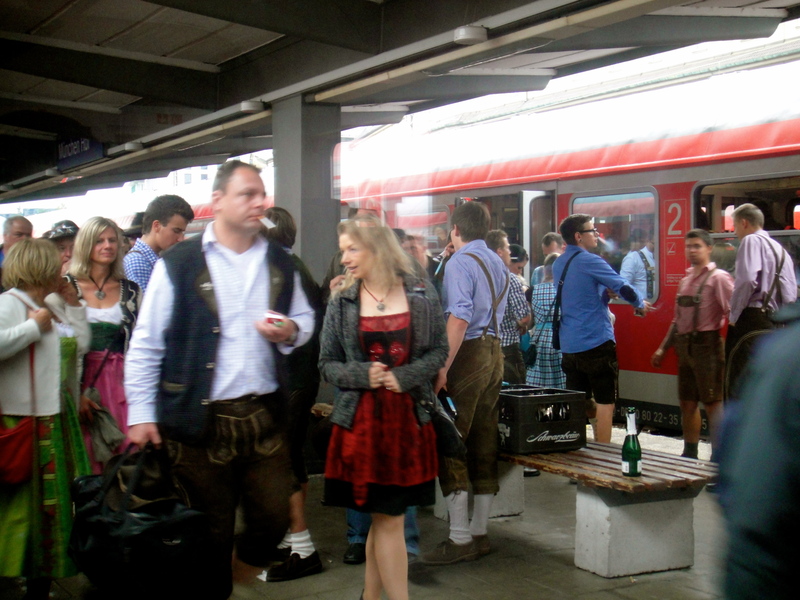 The scene made us glad we weren’t on those trains coming into Munich. There wasn’t a seat to be had! Our train was busy, yet seats were available. 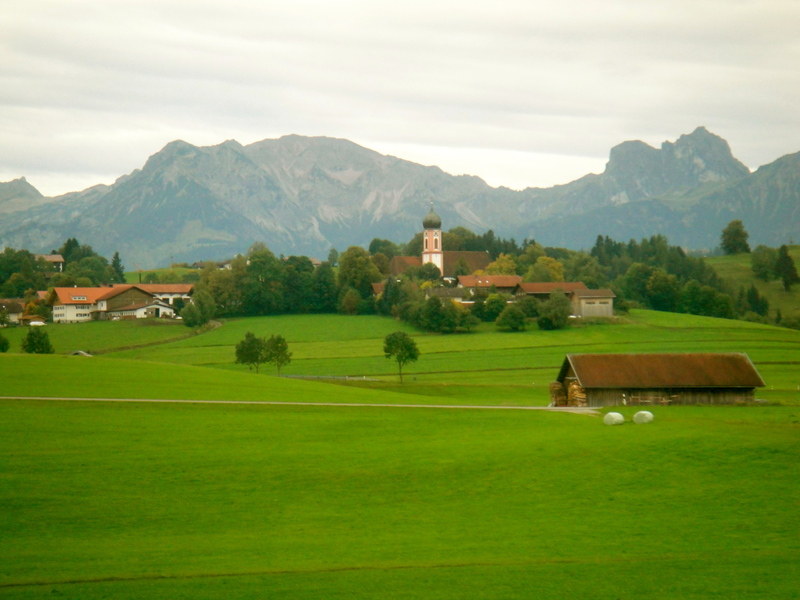 We enjoyed the peaceful two hour ride through the Bavarian countryside. We got off at Fussen and took a cab into the nearby village of Hohenschwanau. 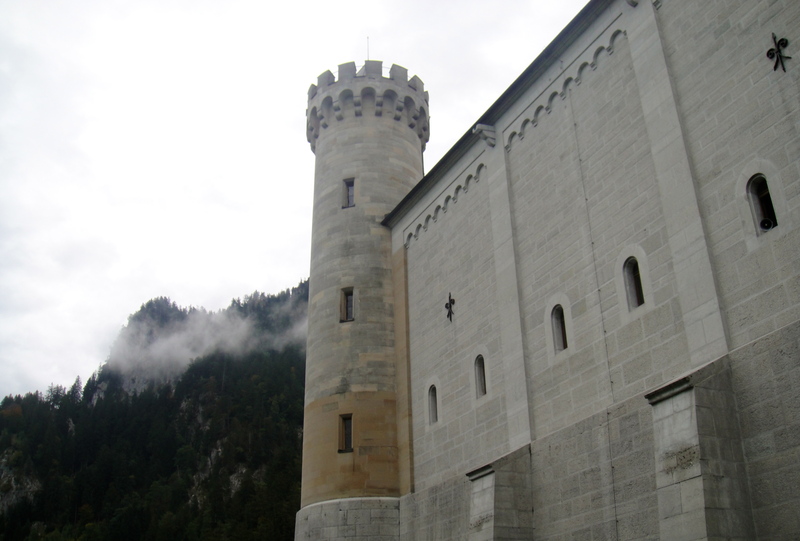 Towering above the town was the Schloss Hohenschwanau. This19th Century castle was built by Maximillian II of Bavaria. 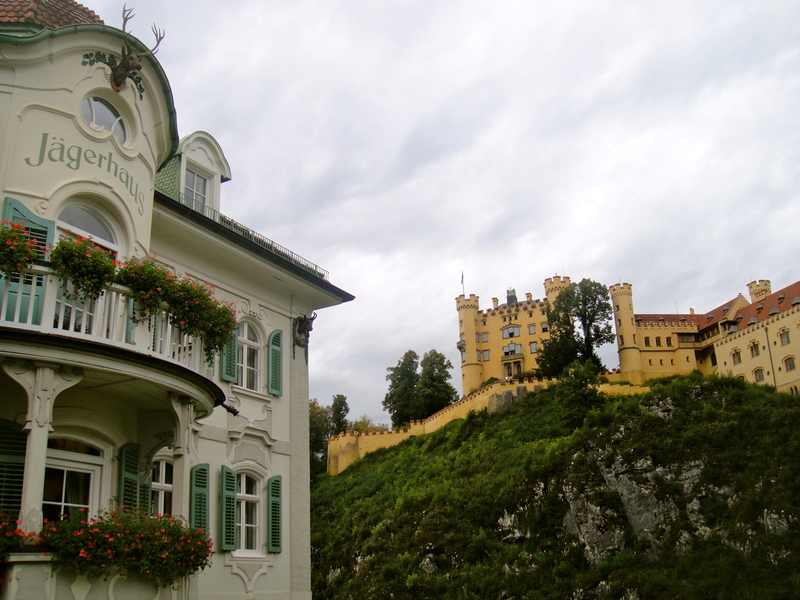 It is more famous nowadays for being the childhood home of King Ludwig II who built Neuschwanstein castle, the castle that Disneyland’s Sleeping Beauty castle was modeled after. 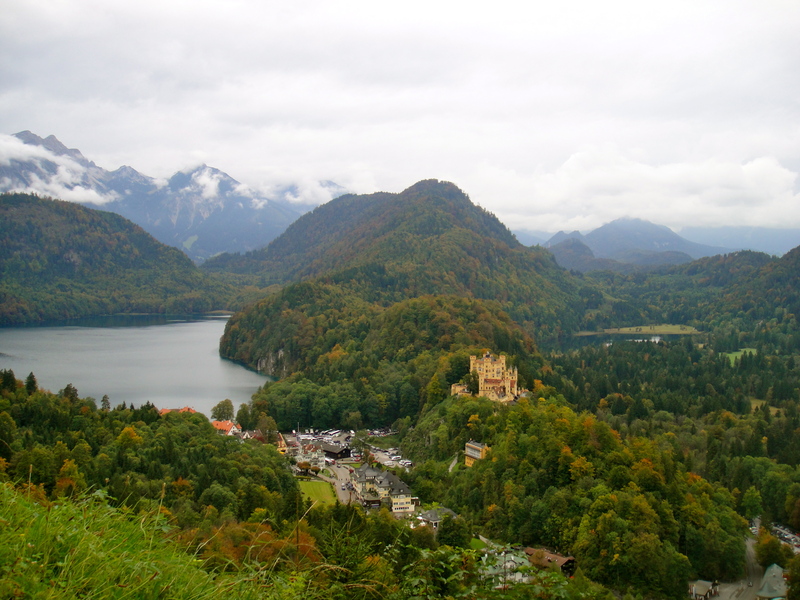 Ludwig II built Neuschwanstein a stone’s leap away from his parent’s house, funded from his own fortune. 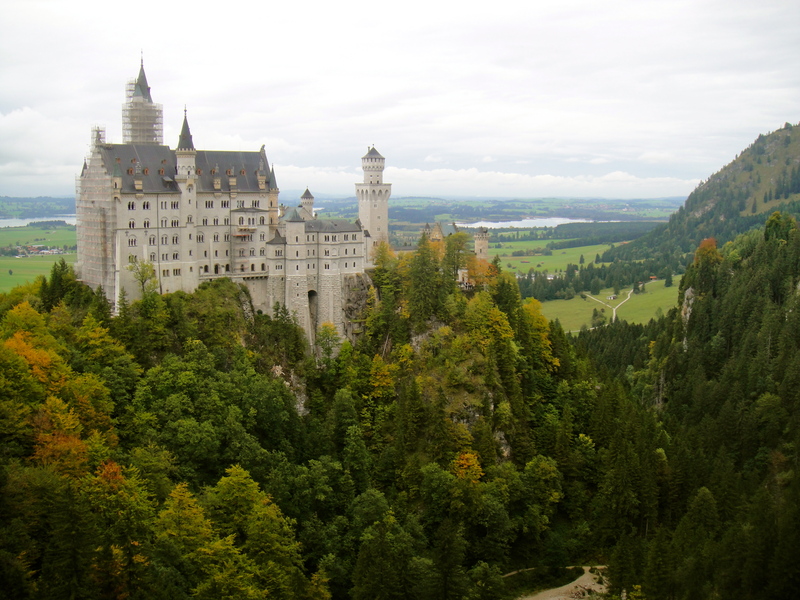 He built the castle as a tribute to Richard Wagner, the composer. He wanted to make it feel like one of Wagner’s pieces had come to life in the castle, to make it a reality. That, and he fancied living in the Middle Ages. The castle helped bring these fantasies to life, creating a retreat which resembled Middle Age living, far outside the city of Munich. 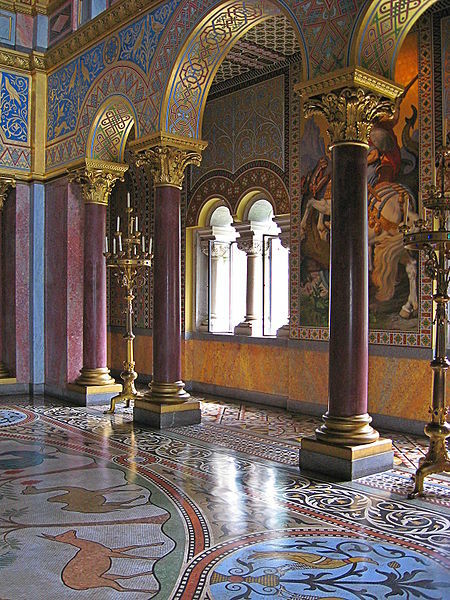 Sadly, King Ludwig II never was able to live inside his castle. He was deposed of his throne due to mental incapacity and building stopped. Only about one-third of the rooms were finished. Shortly after, he died mysteriously in the shallow waters of a nearby lake. There is speculation about the medical prognosis due to the sudden and unexplained nature of his death. Some think that there was a conspiracy to take his crown. Only the shallow waters know, I suppose. We were able to tour the castle because Olga had pre-arranged tickets. For those interested, I’d recommend her approach: buying tickets in advance. You can only tour the castle with a reservation on one of the official tours. When we arrived to pick up our reserved tickets, the wait was 4 1/2 hours to get a tour for those who had not. The inside rooms that we saw were miraculous – amazing detail. 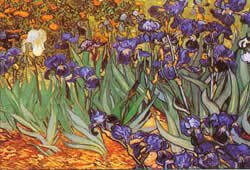 Ludwig was very creative in weaving the stories of Wagner’s operas into the artwork, carvings, and castle floors. We weren’t able to take photos inside, but this photo is courtesy of wikipedia. 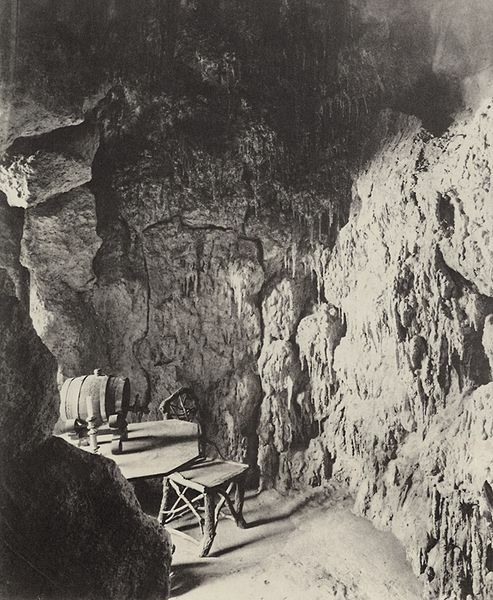 Ludwig even thought to construct a man-made cave that lead from his bedroom to his dressing room, to mimic a scene of a cave in one of the operas. Olga mentioned this was the “original man cave” which drew a lot of chuckles from some of the guys on the tour. 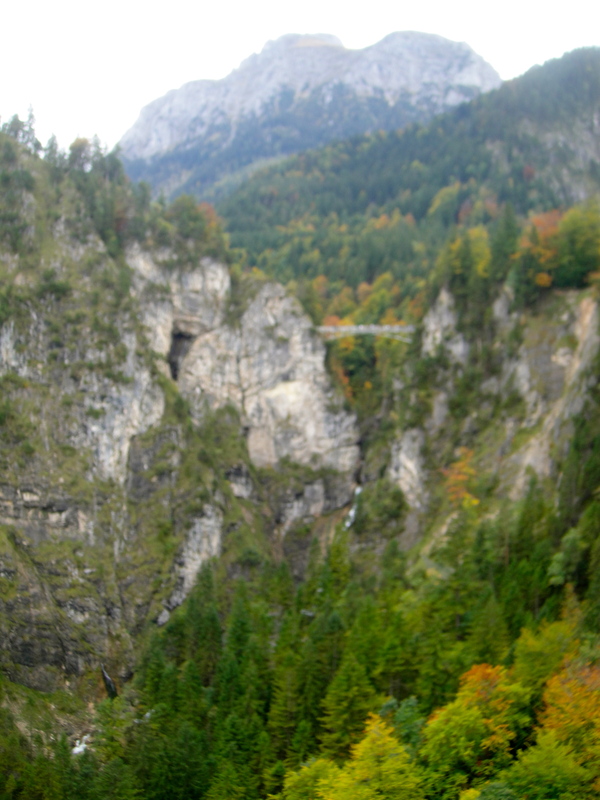 After the tour, we took a lovely walk through the fall foliage and stood on Marienbrücke, Mary’s bridge, to take pictures. The bridge is a 15 minute walk from the castle. If you end up not being able to tour the castle, we would still recommend getting the vantage point from Mary’s bridge. It was pretty awesome. Mary’s bridge is the little white horizontal line in the center of the photo. Sorry our point-and-shoot camera isn’t the best at focusing. 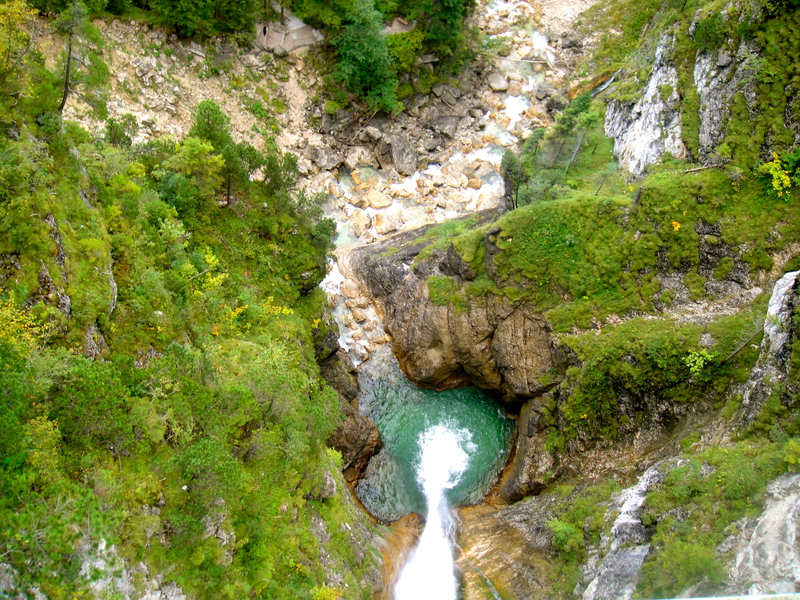 This shaky little bridge made me a bit nervous, especially after looking down! Heidi, Olga, Gabe and me on Mary’s Bridge. We followed our experience by drinking some King Ludwig beer at the little restaurant Bräustübert, underneath the castles. 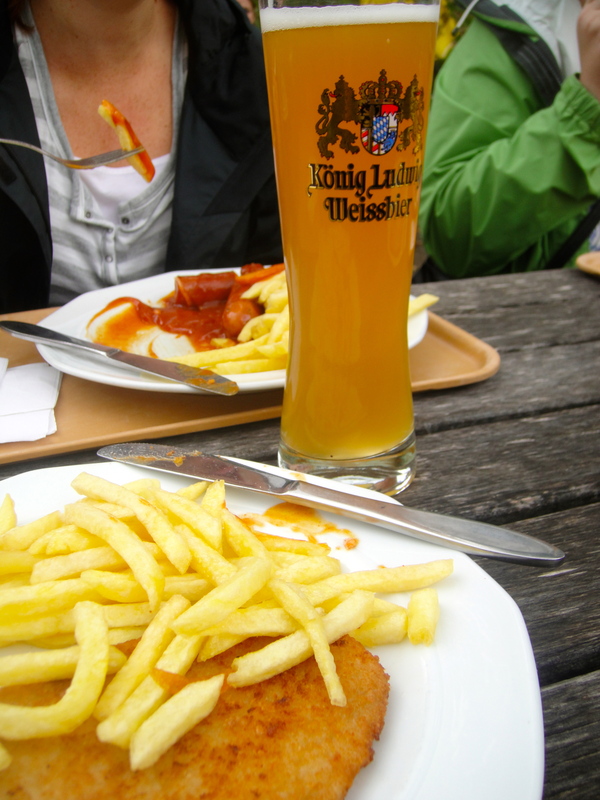 As we’d hiked a mile on a steep uphill, had a tour, and made a stop at the bridge, all within lunch hour, we really were ready for some delicious German food. We all got some form of sausage or schnitzel which did the job of satiating our hungry bellies, along with the delicious beer. My schnitzel and weissbeir. A good lunch. The day before our departure, I mentioned to some Geneva friends that we were going to be traveling to Istanbul for a quick weekend getaway. J, my friend from South Africa, enthusiastically recommended the underground cisterns that are somewhat underneath or nearby Hagia Sophia. 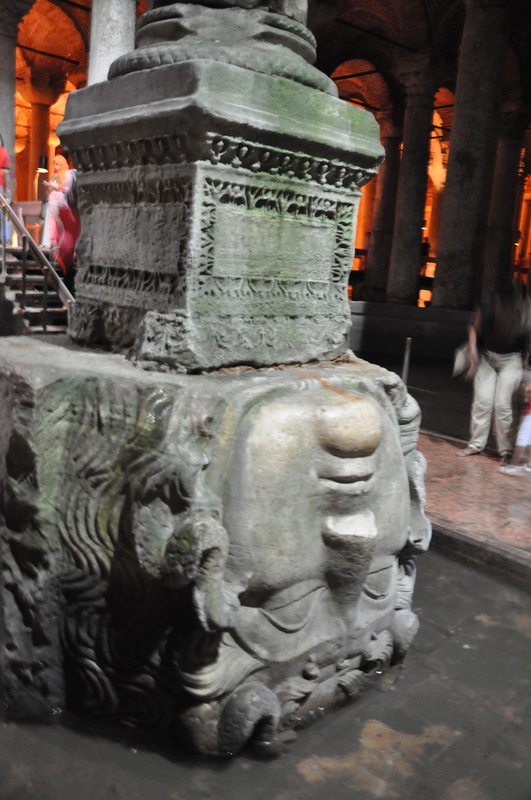 The Basilica Cistern was built in the 6th Century during the reign of the Byzantine Emperor Justinian I, so it is the same age as Hagia Sophia. 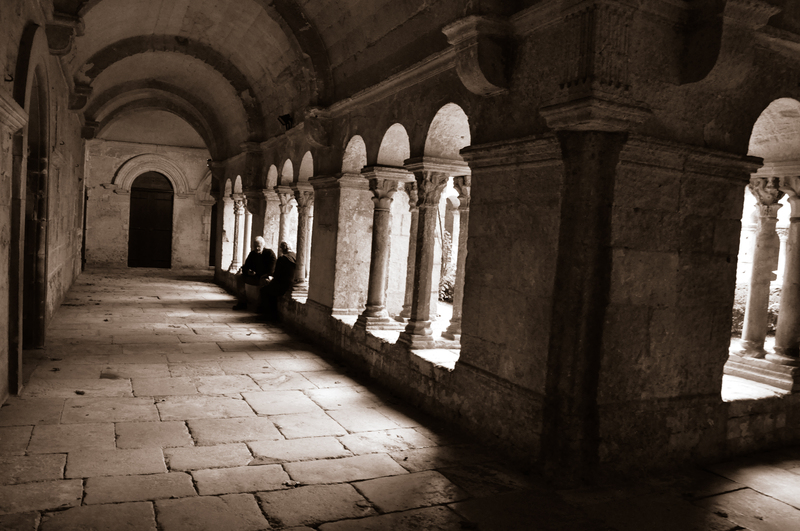 It was originally under a Basilica that no longer stands. It is said that 7000 slaves worked to build the site. The purpose was to provide water for the Great Palace. 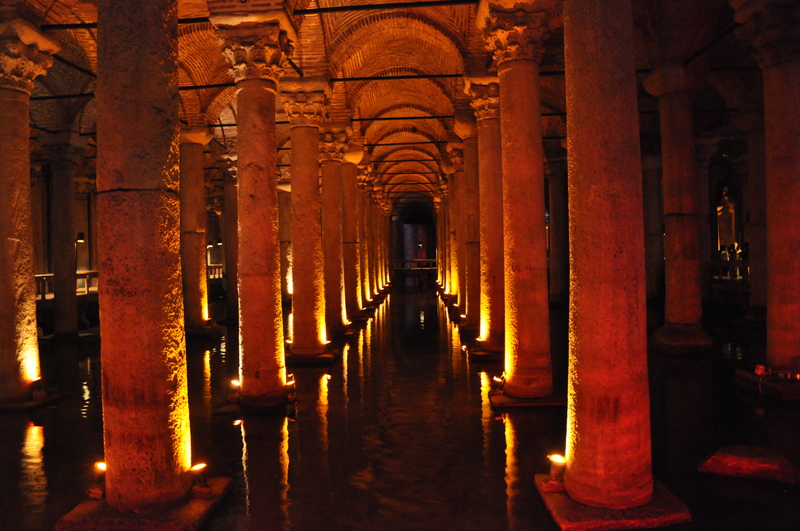 It even continued to provide the water source for Topkapi Palace after the Ottaman takeover in 1453. The ceiling is supported by 336 marble columns. Historians believe many are ‘recycled’ from older buildings all over the Ottoman Empire. The water-tight wall is 4 meters / 13 feet wide. The cistern was filled with water from Belgrade Forest and was transported via aqueducts. It can store 100,000 tons of water! 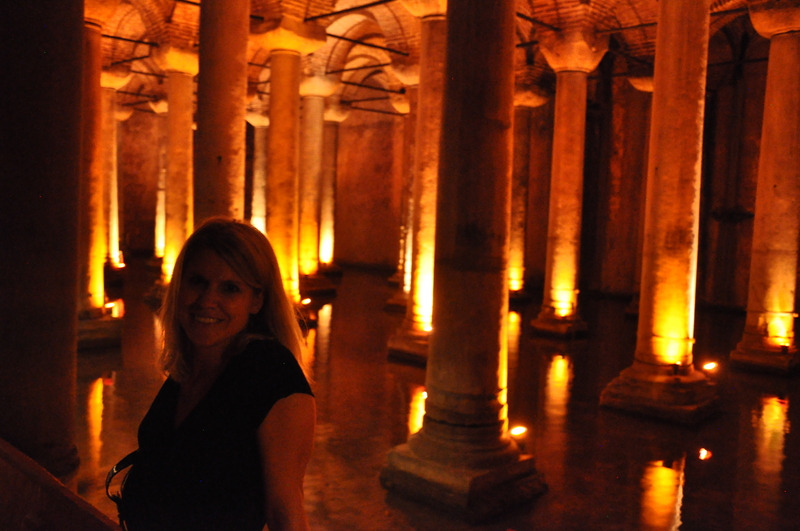 There was such a peaceful feeling in the cistern. I delighted in the fact that there were huge fish still swimming around. 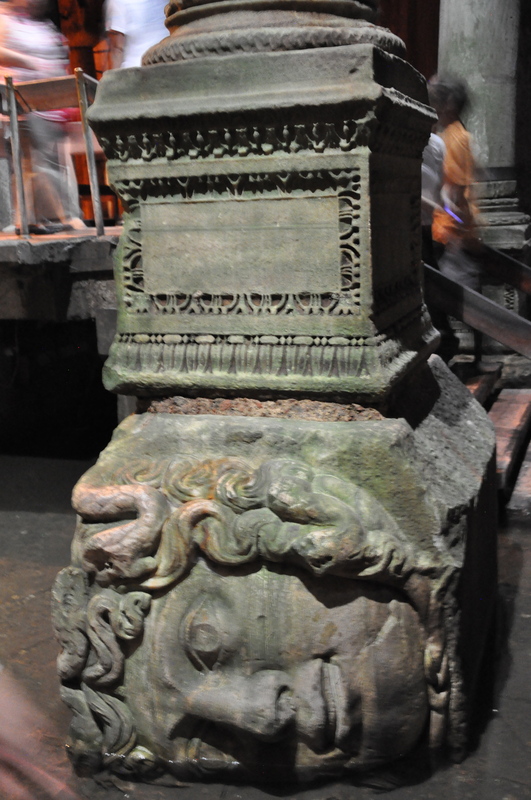 I also enjoyed the two mysterious Medusa head columns – one on its side and one upside down. Gabe said it looked familiar when we walked through. And, for good reason….this enchanting underground site was featured in James Bond From Russia with Love and The International. There was not a lot about this site in our guidebooks, so I really appreciated the unique recommendation.